Successfully Added Outdoor LED Solar Powered Security Light - 480 Lumen, 4000mAh Battery, Motion Detection Sensor, 3 Intelligent Light Modes to your Shopping Cart. 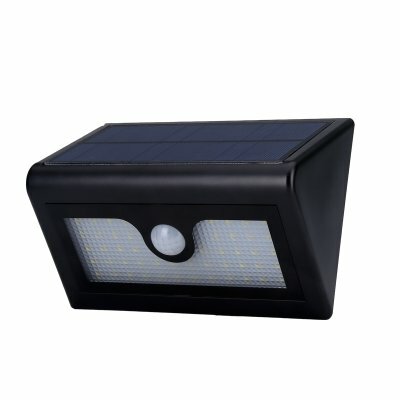 Significantly improve your property security with this solar powered outdoor LED light that recharges its own batteries. This wireless solar powered outdoor LED light is the perfect solution for affordable outdoor security lighting. Thanks to its motion detection sensor this smart LED light detects any motion up to 4 meters – when people come close the LED will be activated automatically and light up the surrounding area for a period of 30 seconds. Powered by the sun it requires no wiring, making it quick and easy to install. Simply mount this outdoor LED security light where ever you want. Affordable, easy to install, and energy efficient – this LED security light significantly improves the safety and security of your property. Holding an IP65 waterproof rating this security light can be fully exposed to rain, fog, snow, and ice without having to fear of it breaking down. With its three different light modes the LED allow you to choose the method in which you like this solar powered LED to protect your property. The Dim Light Sensor Mode ensures that the LED is constantly lighting up the area with a soft and dim light. When people get near, however, the strength of the light will increase and light up the surrounding area. With its Strong Light Sensor Mode the light will be switched off, however, when movement is directed near to the device a strong beam of light will be projected for a period of 30 second to light up the entire surrounding area. Alternatively its Strong Long Light Mode allows you to keep the device constantly burning at full power, no matter whether movement is detected or not. Regardless of what kind of security you are looking for - with its three security light modes this outdoor LED light is guaranteed to offer the right type of protection to your property. Thanks to its auto identification feature this light can identify day time from night time, ensuring that the light sensor will only be switched on and light up the surrounding areas when really necessary due to a lack of natural light. This LED light ensures you'll have great visibility outside and no intruders will be able to sneak on to your property – making it great for lighting up pathways, doorsteps, and patios. Equipped with two massive 4000mAh batteries that automatically get recharged by the product’s built in solar panel this outdoor LED security light seldom runs out of juice. Up to 50000 hours of life spawn ensure that this outdoor LED rarely needs replacement – making it a cheap and easy to use investment to significantly improve the security of your property. Arabic: - في الهواء الطلق LED الشمسية - Chinese Simplified: - 室外太阳能 LED - Czech: - Venkovní solární LED - Dutch: - Buiten zonne-energie LED - French: - LED solaire extérieure - German: - Outdoor-Solar LED - Hebrew: - נורית סולארית חיצונית - Hindi: - आउटडोर सौर एलईडी - Hungarian: - Kültéri Solar LED - Italian: - LED solare all'aperto - Japanese: - 屋外ソーラー LED - Korean: - 옥외 태양 LED - Malay: - Luaran LED Suria - Norwegian Bokmål: - Utendørs solenergi LED - Romanian: - În aer liber solare LED - Russian: - Открытый Солнечный свет - Spanish: - Al aire libre LED Solar - Thai: - LED พลังงานแสงอาทิตย์กลางแจ้ง - Turkish: - Açık güneş LED - Vietnamese: - Đèn LED năng lượng mặt trời ngoài trời.